Farming has been in my blood for generations on my mum’s side. My grandpa Neale, my uncle Andrew and my cousin Harry run a mixed farm growing combinable crops, potatoes, fodder beet catch crops and grass for the livestock. In 2015 my uncle bought my mum, three sisters and me five in-lamb Charollais ewes and we farm just under one hectare (two acres) of our own ground and about two hectares (five acres) which we rent. Now we 50 Suffolk cross mule ewes and nine Charollais ewes. This year we have already started lambing and are getting some strong lambs. Day-to-day: I wake up around 6.30am, sometimes earlier. First, I go to the lambing shed and see how the ewes and lambs are getting on. After checking on the ewes, I feed the ewes and lambs outside, as well as the chickens. I then go and have my breakfast. At 8.15am I go to school. When I finish at 3.05pm, I get picked up and go home to feed the sheep and do other jobs that need doing, including numbering, tailing, castrating lambs, bedding down and cleaning out the lambing pens ready for the next ewe to lamb. All of our ewes are in-lamb to a Charollais as a terminal sire. We lamb all of our ewes inside. The Charollais ewes lamb in early December and the Suffolks start to lamb at the beginning of January. We use Charollais because they are docile, easy to lamb – because they have a small head – and the lambs get up and suckle in minutes. Charollais also have a very good growth rate, which allows them to reach 40kg in just eight weeks, and are also very good at crossing with other breeds. They are one of the most popular terminal sires. Showing: Last year at Burwarton Show we got reserve champion with our Charollais ram lamb. I have also had some rosettes from the young handler and entered two other shows called Tenbury and Minsterly Show. My hope for the future is to be able to grow my flock of ewes and to study agriculture at college. I want to build my Charollais flock and be able to breed the best sheep possible for both breeding and prime lambs. I also hope lamb prices are good. If they are not high enough, many farms will struggle even more than they are at the moment. 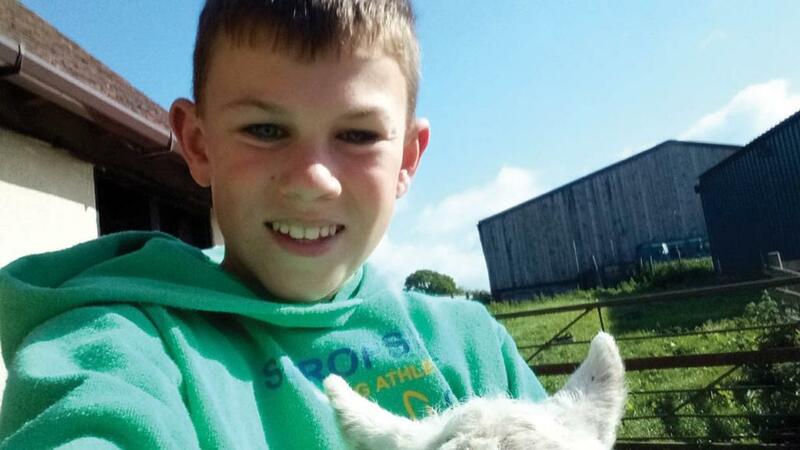 Archie Wickens, 13, is a hobby shepherd on a smallholding with 50 Suffolk cross mule breeding ewes and nine pedigree Charollais ewes. He also helps at Bridgnorth Market sorting lambs.